Greg Reeves, a motorcycle accident attorney, explains your legal rights if you’re involved in a motorcycle accident. According to Alabama motorcycle accident attorney Greg Reeves, the NHTSA (the National Highway Traffic Safety Administration) reports that 56 out of every 100,000 licensed motorcycles became involved in a fatal accident in 2013. To give you some perspective, just 9 out of every 100,000 passenger cars wound up in a fatal crash that same year. This makes motorcyclists roughly twenty-six times more likely to be killed in crashes (per vehicle mile traveled) and five times more likely to be hurt. 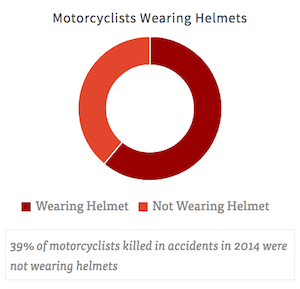 The likelihood of a fatality vastly increases when the motorcyclist in question isn’t wearing a helmet: 39% of motorcyclists killed in accidents in 2014 were not wearing helmets. Even with helmets, accident injuries are common: there were 92,000 motorcycle-related injuries in 2014. The CDC studied 1.2 million non-fatal motorcycle crash injuries (occurring between 2001 and 2008) and concluded that the majority of them are to the legs and feet—30% of the total number of injuries. The next highest percentage—22%—was head and neck injuries. Next was injuries to the upper torso (chest, back, and shoulders), arms and hands, and lower torso/pelvic injuries. Back injuries, spinal injuries, neck injuries, head injuries (including MBTIs, or mild traumatic brain injuries), broken bones, and wrongful death are all possible outcomes of motorcycle accidents. One of the first things you should do after being involved in an accident—even if you don’t believe that your injuries are severe—is to retain a motorcycle accident attorney to protect your rights as an accident victim. A motorcycle accident attorney can help you sort through the legal muddle after you’ve been involved in an accident. If you were hurt badly enough that your productivity at work or your lifestyle at home have suffered, you may be entitled to financial compensation from the other driver if you can prove that their negligence caused the accident to happen. You shouldn’t have to bear the financial burden of another driver’s dangerous or reckless act. Motorcycle injuries frequently lead to trauma which requires intensive, long-term hospital care, which can cost tens of thousands of dollars—not to mention cause you to be absent from work for long periods of time, resulting in lost wages. You can claim all of these expenses in your lawsuit, and the negligent driver will be liable for them. That’s why it’s so important to hire a competent motorcycle accident attorney if you or loved ones have been hurt in a collision. The Reeves Law Firm can help you obtain fair compensation for your injuries and undo some of the damage that accidents can cause to a family’s health or economic prosperity. It’s always a tricky process to calculate fault after an automobile or motorcycle accident. It may seem obvious at first who is at fault in an accident, but a later investigation may reveal that several different parties bear the blame. Various factors must be taken into account: the weather and road conditions at the time of the accident; the influence of intoxicating substances; the number of vehicles involved in the crash; their positions at the outset of the incident; and the precise chain of events which occurred (which can be difficult to establish if there were no witnesses apart from the people involved in the crash). The best way to determine whether or not you have a case is to ask yourself whether the other drivers involved in the accident (and you yourself) followed the minimum standard of safety prescribed by Alabama’s driving laws. There is a clear code of safe conduct spelled out in the pages of the state’s driving and transportation safety codes. If someone involved in the accident deliberately or accidentally flouted these codes, then they can be sued by other drivers who were injured in the accident. Other complications may arise when you put in your insurance claim. It may be that the people who struck you had no insurance. The only way to recover medical bills and other expenses is to file a lawsuit against the driver of the car which collided with you in civil court—yet another reason to hire an aggressive, savvy motorcycle accident attorney as soon as possible after the accident takes place. In the days following your accident—as soon as humanly possible—see a physician and have yourself thoroughly examined. Collision injuries often take 24 hours to several weeks to develop—your hurts may be more severe than you initially believed. It’s also important to see a physician so that a paper trail may begin—your injuries were fully documented right from the beginning, which will make it easier for your motorcycle accident attorney to build your case. The next step, of course, is to hire a motorcycle accident attorney. It will be a hard fight to secure just compensation from the other driver’s insurance company. Insurance firms lose money after an accident, particularly if the person they insured was at fault. They won’t be eager to pay out. You need to file a complaint, and quickly—the statute of limitations for personal injury cases in Alabama is two years. If you miss that deadline, your chance to seek justice in court is lost forever. You’ve kept diligent medical records and now you’re ready to hire the best motorcycle accident attorney you can find to represent you in civil court. For this type of case, you need intelligent, diligent, and experienced legal counsel. Let a professional motorcycle accident attorney at The Reeves Law Firm help you seek justice. We specialize in personal injury and accident law, and have years of experience helping people obtain compensation for spinal and back injuries, mild traumatic brain injuries, broken bones, and wrongful death. If you’ve been injured in an accident and you have sky-high medical bills to pay or your lifestyle has been impaired, get in touch with us now. We’ll help you defend your rights. Call us at 256-355-3311 for a free and confidential consultation.